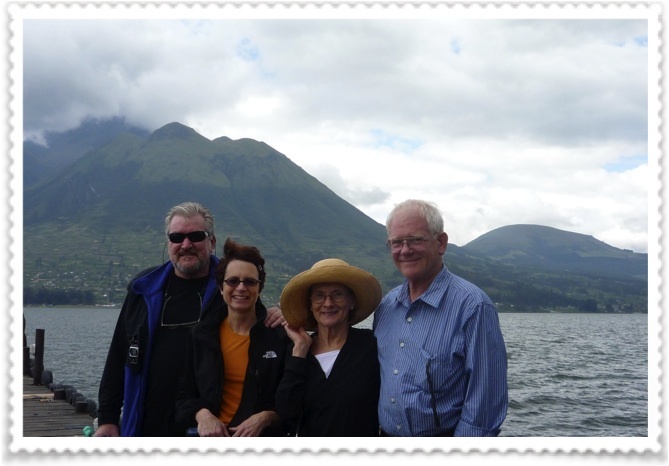 Yesterday we left Quito and headed north on the Pan American Highway towards Otavalo which would be our next stop. 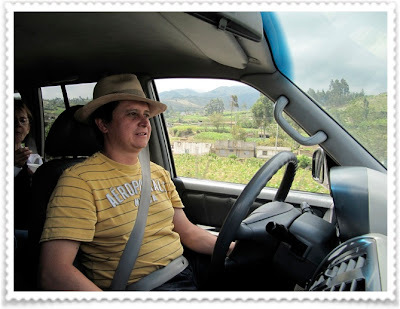 Our driver is absolutely wonderful and very knowledgeable of his country. We started by driving through the Occidental mountain range which was an absolutely beautiful landscape of mountains, volcanos, amazing foliage and lush fields. The countryside seemed to go on as far as the eye could see and the hills had so many different shades of green that they looked like a patchwork quilt. We stopped along the way at a vantage point to take some photos and the minute we stepped out of the car a group of stray dogs approached us. 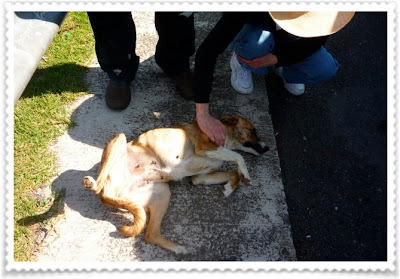 The dogs were very shy and kept there distance except for one very sweet female dog that immediately ran up to Mom and laid at her feet for belly rubs. This dog knew how to work it and as soon as we got back into the car, she stood at the door and just looked at us with the sad dog eyes. We just knew that if we had called her into the car she would have happily jumped in without a second thought. There are a lot of stray dogs in the more rural areas and that’s hard to see. Mom and I both agreed that if we moved to Ecuador we would have to start a dog rescue mission. There were so many sights to see along the way that we were snapping pictures left and right. 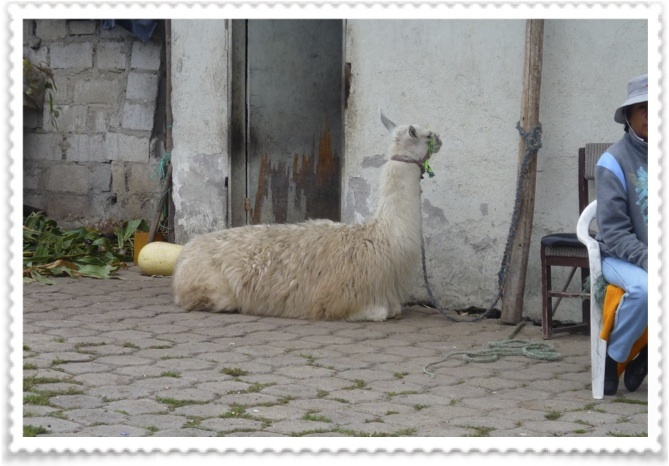 We kept seeing cows, sheep and llamas staked on the side of the road. 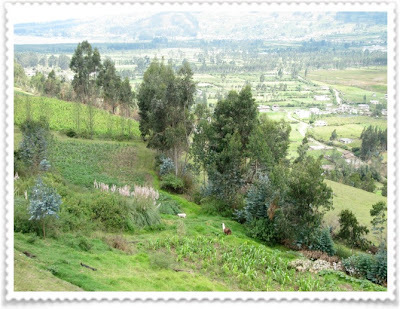 When we asked our driver about this he explained that a lot of the indigenous farmers don’t have a lot of land for their animals to graze on, so every day they lead their herds to a different spot on the mountainside and stake them so that they can graze. It was really strange to see cows standing right along the side of the road. One of the places we stopped to take some pictures had some little stalls that sold goods to the tourists. Outside of one of the stalls was a Llama. It seems that the animals go where ever their owners go. We then drove up to the equator and actually stood right on it with one foot on each side. 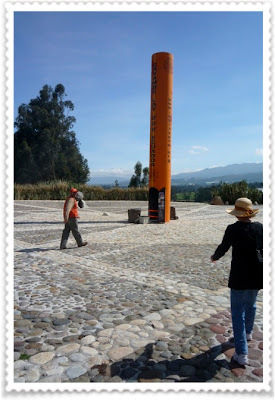 There was a sundial that had been erected fairly recently using GPS to ensure it’s accuracy. A tour guide explained to us how the seasons work in accordance with the earth’s rotation. It was very fascinating to learn how everything works together and to find out that what we had originally been taught in school about the earth’s rotation was not correct. As we worked our way down into the valley, Carlos stopped at a couple of small roadside stores to let us taste some of the local food. 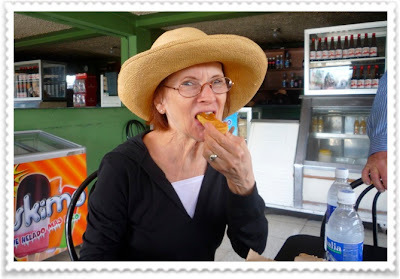 We first ate what they call Bizcochos with Dulce De Leche. The Bizcochos were somewhere between a bread and a cookie and were just slightly sweet. You then spread the Dulce De Leche on the Bizcochos and eat them. They were quite yummy. 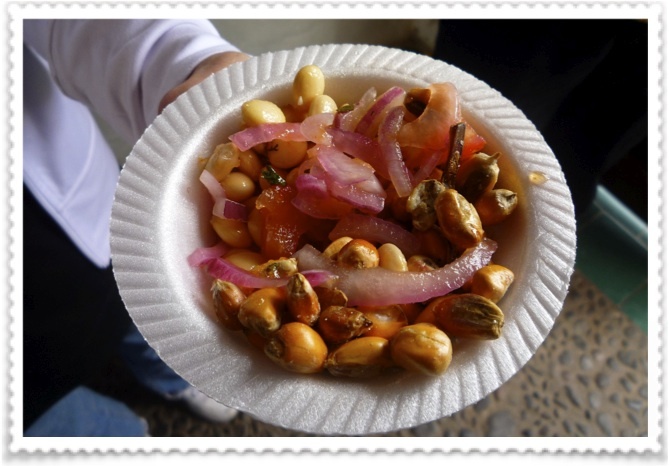 We stopped at another roadside store and tried Chochos Beans, a dish that the Ecuadorians consider “Fast Food.” Carlos explained to us that the beans are somewhat toxic and must be soaked for several days and than thoroughly rinsed before consuming. They than make what they call a Ceviche out of the beans by adding pickled onions, tomatoes, roasted corn and a little bit of hot sauce. It was served in a paper bowl and we took it with us. Mom and I both found this dish to be very tasty as well. As we drove down from the mountains and in to the valley below we came across one of the many beautiful lakes in Ecuador. Carlos suggested we stop for lunch at a restaurant on the lake and enjoy the view. When we pulled up I think Rod got weak in the knees. The property had rental cabins situated on it with a view of the lake and the mountains that would rival anything you saw in the U.S.
After a relaxing lunch we got back in the car and headed towards the famous woodcarving village of San Antonio. 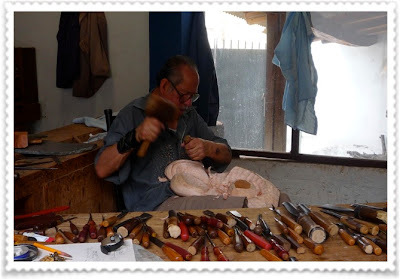 The village streets were lined with little shops and woodcarvers busily carving there next masterpiece. Mom and I found some pieces that we absolutely fell in love with, but we made the mistake of not snatching them up right away. When we decided to go back to make our purchases the shops had closed for Siesta. 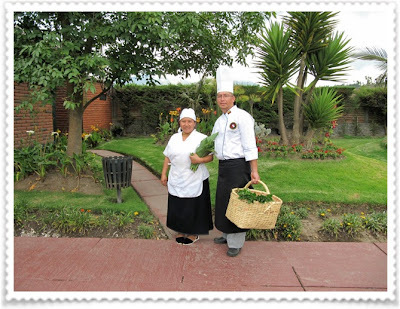 We left empty handed, but Carlos said he would take us back the next day. On the way out of the village we stopped at a woodcarver’s workshop and the gentleman gave us a tour of his small shop and told us that he had been carving since a small child. It was really amazing to see how many tools he needed to complete his project. 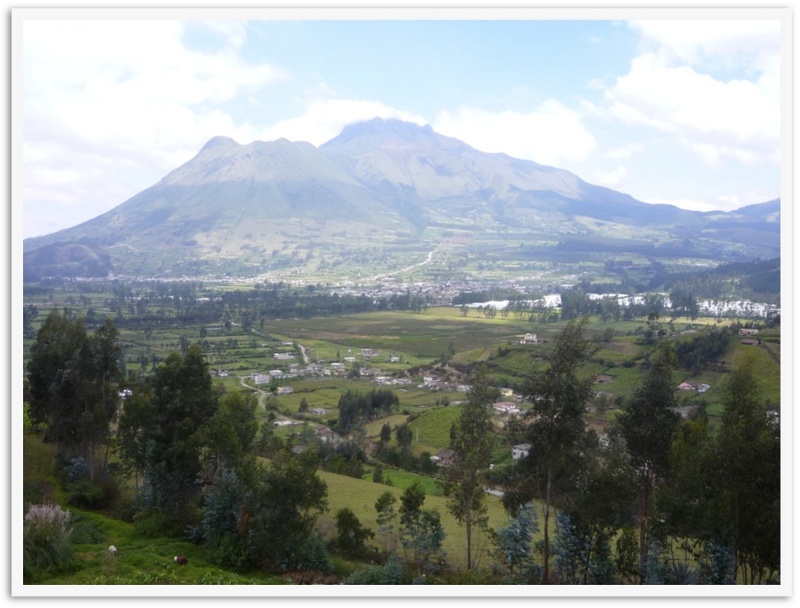 Our day was now drawing to a close so Carlos headed to the town of Otavalo where we were to stay for two nights at a local Hostel. When we pulled up to the place where we were to stay, we noticed that it was situated right on a very busy, noisy street not unlike the hotel we had our first night in Quito. 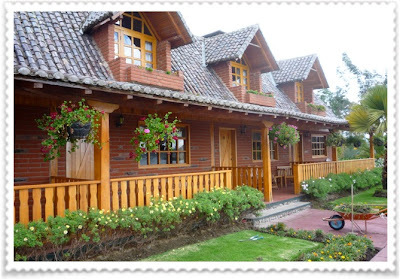 We decided to go ahead and brave it hoping that once we got inside of the Hostel we would be wowed by the surroundings. We checked in, got our keys and headed to our rooms. Yikes, our room was right over the street. It was dark and dingy and didn’t even have any hot water. 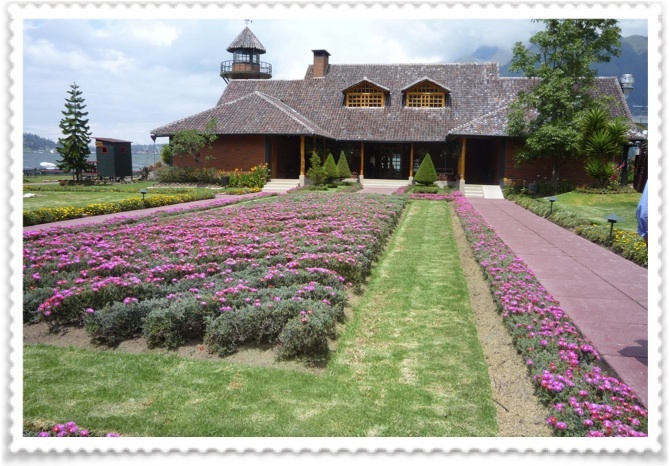 With visions of the first night in Quito still dancing in our heads, we handed the keys back and left as fast as we could, forfeiting the money we had already spent for two nights worth of reservations. We asked Carlos to find us another Hotel and after a few phone calls he had us settled into another quieter hotel that had hot water (Yea). 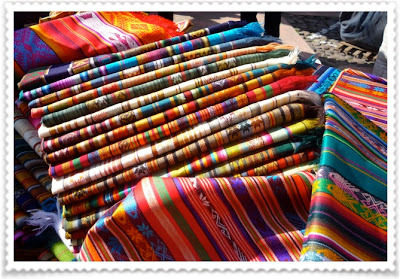 After Carlos dropped us off at the hotel and helped us unload our luggage, we decided to run to the textile market, which is what Otavalo is famous for. It was a bit overwhelming with all of the stalls and the merchants were all trying to sell us their goods, but of course we couldn’t understand them. Once again the language barrier became an issue. 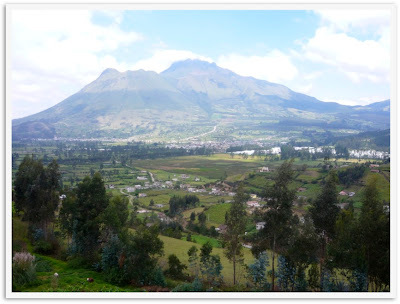 We returned to the hotel for the night feeling a little frustrated and disappointed in yet another hotel fiasco and the town of Otavalo itself seemed like just another dirty noisy town. After a bottle of wine and much conversation the mood lightened up and we decided to change our plans once again and have Carlos book us another hotel for the next night in a quieter area of the countryside. We all went to bed in a much better mood with high hopes and looking forward to the next day and another adventure.